CINEMANIA! A monthly film series highlighting your favorite genre films on the big screen, hosted by Film Programmers Andrea Canales & Dan Stone (The Unfathomable Film Freakout). Presented with support from Zia Records! It was only a matter of time before Christopher Lee's Dracula visited Swinging London, arriving fashionably late for the party in 1972. 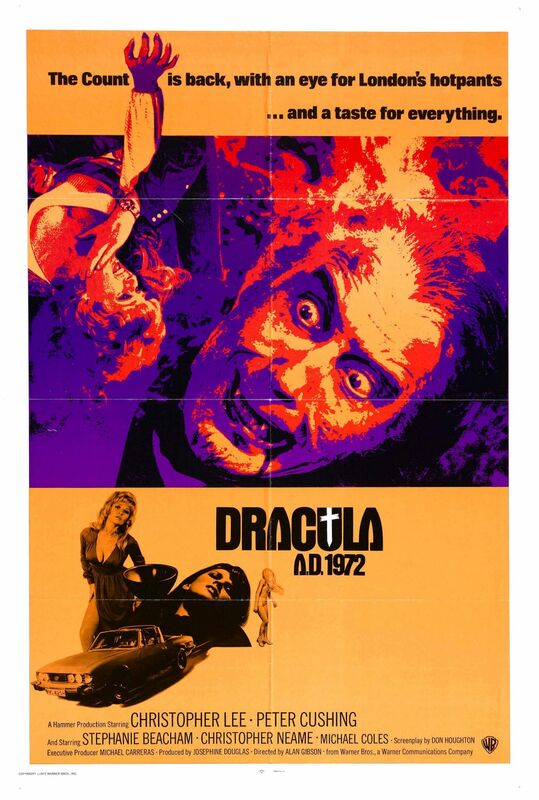 In Dracula A.D. 1972, Count D was dispatched in the 19th century with a carriage-wheel spoke. The vampire's ashes and fancy ring are handed down to a young Londoner named Johnny Alucard (Christopher Neame) who looks as though he's seen A Clockwork Orange too many times. Proposing that his hippie posse look for new kicks ("yet as old as time"), he holds a Black Mass and summons you-know-who. Peter Cushing joins Lee yet again; luscious Stephanie Beacham, in an amazing shag haircut and purple velvet, is Cushing's granddaughter. She considers grandpa's scientific interests "way out," but then again, their last name is Van Helsing.. The time-period switch makes the grooviness seem laughable, although otherwise this is an acceptable outing, especially for Lee's suave, overtly sexual take on the role. It was his penultimate entry in the Hammer Dracula series, and is certainly better than the finale, The Satanic Rites of Dracula.